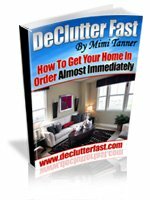 Eliminate Catalogs - Home Organize It! Eliminate catalogs from your mailbox and simplify your (snail mail) life. You'll also be helping to save natural resources. Time Savings + Natural Resources Savings = Win-Win! Stop receiving unwanted catalogs and save up to 9.6 hours a year. Did you know that there are over 19 billion catalogs mailed annually to U.S. consumers? And over 53 million trees per year are cut down to make those 19 billion catalogs! Do you sometimes feel like your home is filling up with catalogs? Enter... Catalog Choice. This is a free online service that allows you to eliminate catalogs, reduce your mailbox clutter, which helps to save natural resources. Taking the time to visit Catalog Choice and removing your name from unwanted catalog lists will be time saved that you can spend doing something fun. Millions of companies have found catalogs to be an effective marketing tool but even they do not want to spend the money sending them to people who don't want them. However, it's more cost effective for them to do targeted mass mailings than to identify precisely who really wants to receive them. Catalogs are made from paper which of course comes from trees and trees help prevent global warming. Even if you order from a catalog and then recycle or throw them away, they still can end up in landfills. Landfills put out methane too, which is one of the worse global warming gases. Each time you receive a catalog you don't want, login to Catalog Choice and remove it from your mailing address. Within a few short months, you'll start noticing a difference. And so will our world. Return From Eliminate Catalogs To Home Organize It!